Dante's View has a true "woah!" factor. From the top of the mountain ridge, 1669 metres up, Badwater Basin's dazzling salt deposit scars unfurl below, flanked by yet more mountains on the other side. The Basin is the lowest point in North America, 86 metres below sea level, and it holds the record for the hottest temperature ever recorded – an outrageous 56.7 degrees in July 1913. But from Dante's View, it can be 16 degrees cooler than in the twinkling, eerie depression below. Artists Drive, a one way, 17.5-kilometre loop near the Badwater Basin, is often cut through the rock, making the road a mini-canyon floor. The bizarre rock formations come thick and fast, but it's the colours that are as strange as the shapes. The section known as Artists Palette is the zenith of the odd colouration caused by minerals – it's a riot of greens, pinks, teals and purples. On the Nevada side of the Death Valley National Park, Rhyolite is a highly photogenic ghost town, where abandoned buildings pose in front of vegetation-free mountains. To make it even stranger, a series of art installations have been installed there – including a group of white ghostly statues and a rusty 2D figure of what appears to be a cowboy with his pet penguin. 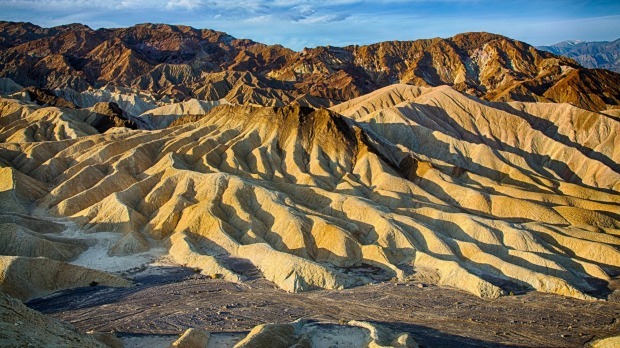 Zabriskie Point, a few kilometres up the road from Dante's View, offers something completely different. Here, the earth breaks into strange yellow folds that look like gnarled hands. Take it all as one, and it looks as though a giant blancmange has been dropped down into the desert. The strange shapes and milky-yellow colourations come from the sediments of a lake that dried up 5 million years ago. Dining options are thin on the ground, but the Inn Dining Room in Furnace Creek is something of a treat. The richly decorated, atmospheric room serves up hearty dishes using desert ingredients such as cacti and dates from the on-site palm grove. 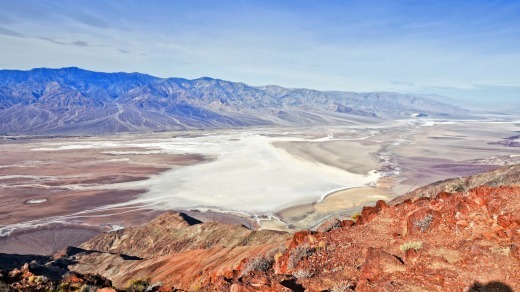 Death Valley is most easily approached from Las Vegas, but the twisting, turning drive in the other direction over several mountain ranges towards the snowy peaks of California's Sierra Nevada is unforgettable. The big boy here is Mount Whitney – 4421 metres high, and the highest mountain in the 48 contiguous US states. The twisting, mountainside-hugging road up to Whitney Portal climbs 2552 metres of it, with alpine lakes and hiking trailheads at the road's end.